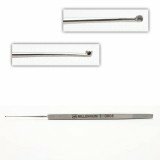 Micro curettes for use in eye procedures feature very small ring or scoop tips. Popular patterns include Chalazion and Meyerhoefer. If you don't see the eye instrument you require, contact us. We can reference any catalog number from any company.